Last week we pulled in about 1/2 of our gorgeous sweet potato crop. We harvested about 14,500 lbs in parts of two days and shuttled them into the greenhouse to cure. A good sweet potato crop makes a mat of foliage and vines that completely covers the ground. That is part of the reason why it is exciting and somewhat suspenseful as we go to harvest. We can take a guess at what the crop will be based on how vigorously they have been growing over the course of the season. We can pull up some of the potatoes in different sections of the field and get an idea of their size, but we never know how good the crop will be until we start digging them in earnest. This year’s crop did not disappoint. Last week we were awed by the size and the beauty of sweets that were coming out of the ground! The sweet potato harvest is a multiple step process. Sweet potato vines don’t have an end point to their growth. They will just keep growing and growing until it frosts. The potatoes themselves are very frost sensitive so they must be harvested before it frosts. This means the thick mat of vines and foliage must be dealt with in order to get at the sweet potatoes for harvest. The way we do it involves 3 separate tractor operations before we get on our hands and knees to unearth and crate them up. The first step is to mow the foliage. In this step we need to be careful not to damage the sweet potatoes as some of them stick out of the ground a little bit. The mower deals with the leaves pretty well but there are still a lot of intertwined vines that are too close to the soil surface to mow. We need to cut those vines before we can get through there with our lifter or the vines will get all bound up in the tractor implement. To cut the vines we have 3 sharp discs mounted on a tractor tool bar. We drive through the field with this implement cutting the vines in a swath that matches the foot print of our final implement the undercutter bar or lifter. The undercutter loosens the soil and lifts the sweet potatoes a little bit which makes pulling them out of the dirt by hand exponentially easier. After the tractor work is done we then go down each bed on our hands and knees with crates in hand. We follow the vines into the ground and pull up cluster after cluster of gorgeous sweet potatoes. We fill up crates and leave them in a ceremonious line along the edge of the field. We’ll then return with a tractor and trailer to load the crates onto. When the harvest is complete we “cure” the sweet potatoes in the greenhouse. Sweet potatoes require curing to heal any wounds from harvest, to sweeten the actual potatoes, and to prolong their storage life. Ideal conditions are hard to achieve but our greenhouse gets pretty close. Ideally sweet potatoes like 90 degrees and 90 percent humidity during the curing period. We can get the temperature correct in there but getting the humidity that high is near impossible. Every day while the sweets are curing we flood the floor in the greenhouse and let that water evaporate to humidify the air. We keep the sweets at these conditions for a minimum of a week. In addition to healing wounds and prolonging storage life this curing period triggers the development of sugar creating enzyme. Enjoy those sweets and the rest of the harvest! 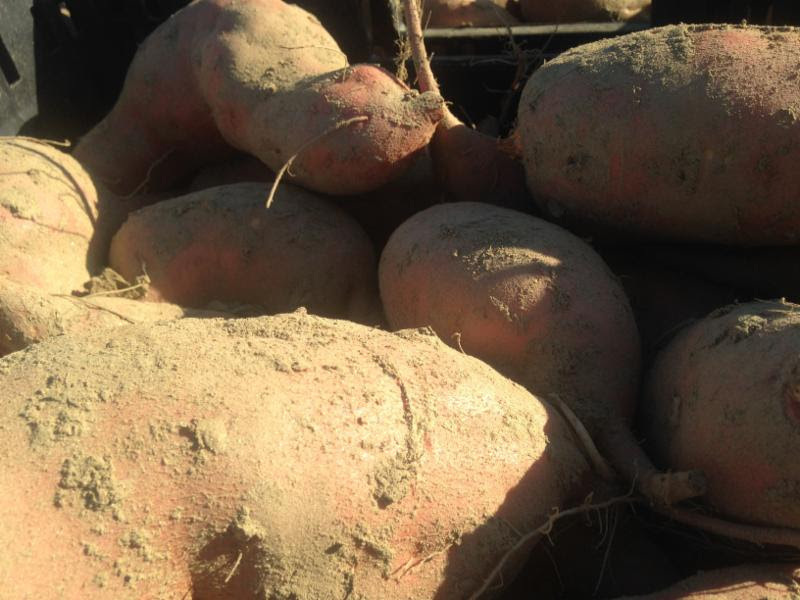 This entry was posted in Farm Stories and tagged farm direct coop, farm stories, riverland farm, sweet potatoes by Jennifer Moore. Bookmark the permalink.